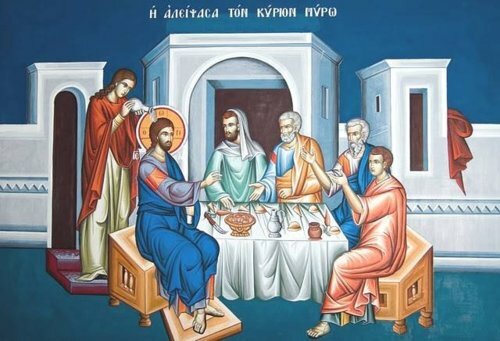 BRIDEGROOM MATINS: CANCELLED, CONFESSIONS: 5:30 PM – 6:15 PM, PRESANCTIFIED LITURGY WITH ANOINTING FOR HEALING (FASTING MEAL TO FOLLOW – fasting meal dishes, and fruit, nuts, bread, wine): 6:30 PM. 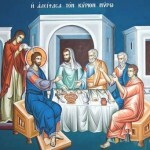 During the Presanctied Liturgy the Gospel reading is Matt 26: 6-16. We hear the story of the woman who anointed Jesus’ feet with precious perfume and dried them with her hair in the house of Simon – in preparation, as our Lord said, for His burial. We also hear of Judas’ agreement to betray our Lord to those who sought His life for 30 pieces of silver. It is also customary on this day for the Sacrament of Holy Anointing of the Sick or Holy Unction to be given to all the faithful who request it, in recognition of the fact that all of us suffer from physical, emotional and spiritual ills, not all of which are immediately apparent.